Save a lot on the Student Activity Book 1! 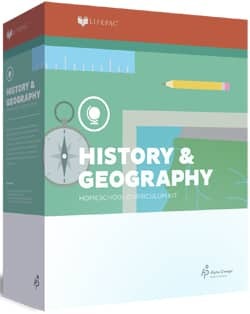 With hundreds of images and dozens of maps (all in black and white), each volume of All American History is a complete year’s curriculum if you combine the reader with the Student Activity Book and the Teacher’s Guide. If you want to add art, a study of early American artists with Volume 1 is a good supplement. The Student Reader is formatted like a textbook, but we think this series combines the best qualities of a text and homeschooling. Each lesson contains three sections examining the atmosphere in which the event occurred, the event itself, and the impact this event had on the future of America. The All American History Volume 1 Student Activity Book includes maps, forms, and review questions. Each student needs one. See Sample from the Student Activity Book Opens in a new window at the publisher’s website. We also have a Bundle 1 Set and other components below. 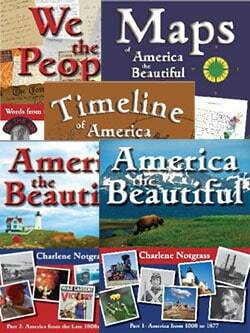 All American History Volume 1 covers Exploration through 1840. It has 32 weekly lessons. It is suitable for grades 5 to 8. Being homeschool friendly, it is adaptable for older and younger students. Units covered in the first volume are Age of European Exploration, Colonization, the Period of Revolution, and the Period of Establishment and Expansion. Our youngest son who used it in 8th grade liked this course because it is written in an understandable way. He also liked the format of the activities. Now my daughter wants it for her children. She will only need to purchase a Student Activity book since the Student Reader is a hardcover book. See Sample from the Volume 1 Student Reader Opens in a new window at the publisher’s website. The All American History Volume 1 Teacher’s Guide and Answer Key has hands-on and research ideas, great teaching tips, answers, a book list, and additional hands-on and research ideas for younger students. It was updated to a second edition with added features–still fully compatible with the 1st (and only) editions of the Student Reader and Student Activity Book. The Teacher’s Guide and Answer Key Volume 1 is divided into eight sections. Section One: How to Use All American History Vol. I starts with a short introduction on how to use the curriculum and set up a schedule for your family, co-op, or Christian school setting. There are also detailed instructions. Section Two: Teaching Resources has four-unit resource sections. Each unit includes Project Possibilities, Book List Reminder, Timeline Dates, Mapmaking Reminder, Review Games, Family Activities and a Unit Checklist. Section Three: Book Lists has an extensive annotated book list for each of the four units in the book. They are listed by primary, middle, and secondary grade levels. Section Four: Maps has directions for completing the maps in the Student Activity Book. answers to the Student Activity Book are shown. On each page in this section, two reduced-size student pages are shown with the filled in answers. This type of answer key makes it easier to grade. Section Five included the Answer Key to Further Study Questions in the Student Activity Book. Section Six has the Answer Key to the forms maps, and Review Questions in the Student Activity Book. Section Seven has 14 Optional Forms to photocopy. They are helpful in creating a tieline or doing additional research or creating notebooks. Section Eight contains many images that are reproducible and perfect for timelines and for the optional Notebook Timeline form. Each weekly lesson in the Student Reader and Student Activity Book is formatted in a logical and easy-to-follow format. See Sample from Teacher’s Guide and Answer Key Opens in a new window at the publisher’s website.